China is betting big on AI. Big tech companies, state-run initiatives and the investment community are all sharpening their focus with the belief it will transform every part of the economy. Nobody wants to be left out – and some are even returning to be part of the story. Processors and data sets are taking the place of warheads and missiles in what sounds like a new arms race. But instead of Russia and the US squaring off, it is the largest and the second-largest economies in the world competing for advantage on what could be the new battleground for influence and power: AI. While the US is still leading both in terms of innovation and investment in this apex technology of the information age, China is running fast and catching up. In fact, several key factors beneficial for progress in AI seem almost perfectly aligned for China to succeed: huge data pools ready to feed AI's hungry algorithms created by a big, culturally coherent group of digital consumers; a government that supports the development of AI with ambitious plans and subsidies; and a Chinese tech community comprising CEOs of leading internet companies and founders of small startups, all of whom are embracing AI with an almost religious zeal. Working towards a goal: The start-up company Sinovation Ventures plans to grow its AI team from 30 full-time employees to 100 within the next year. A key player in this new game is Baidu, China's equivalent to Google. Baidu claims its search engine has 760 million users who leave behind a digital trail of their daily requirements, personal interests and business needs, filling Baidu's treasure chest with zillions of terabytes of useful data. 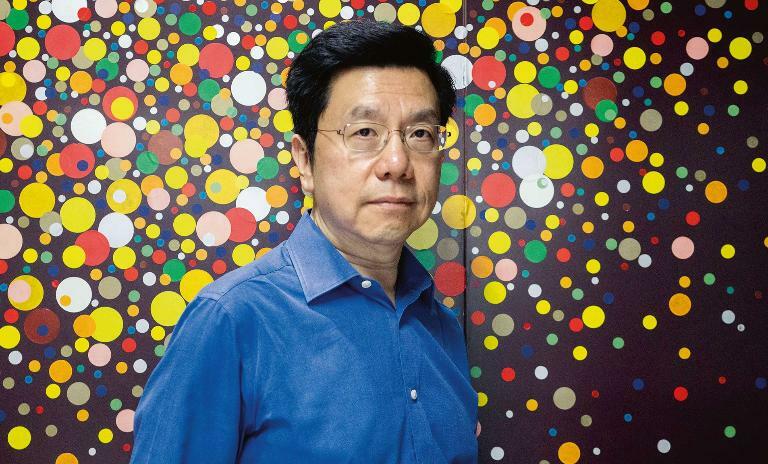 "With regard to AI, it is undeniable that data brings great advantages to big companies," says Liu Wei, vice president of Baidu and the CEO of Baidu Ventures. Founded in 2016, Baidu Ventures is Baidu's new early-stage investment unit that is focused exclusively on artificial intelligence, virtual reality and augmented reality projects. Liu Wei, formerly a partner at Legend Holdings' investment arm Legend Star, aims to raise $200 million and invest it in AI startups. Apart from the usual business goal of making a profit, Baidu Ventures is also driven to build, as Liu Wei puts it, "the biggest AI ecosystem platform in China," bringing together underlying technology manufacturers – such as makers of advanced cameras and 3D sensors – with early AI adopters in various industries in China such as intelligent retail companies and logistics providers. That is why Baidu Ventures is investing millions of dollars, and also why it is making it easy for startups to gain access to Baidu's data and AI research. "Baidu's voice recognition and automatic driving technology come from the accumulation of large business data, and these technologies have been opened to developers as open-source platforms," says the Baidu Ventures CEO. 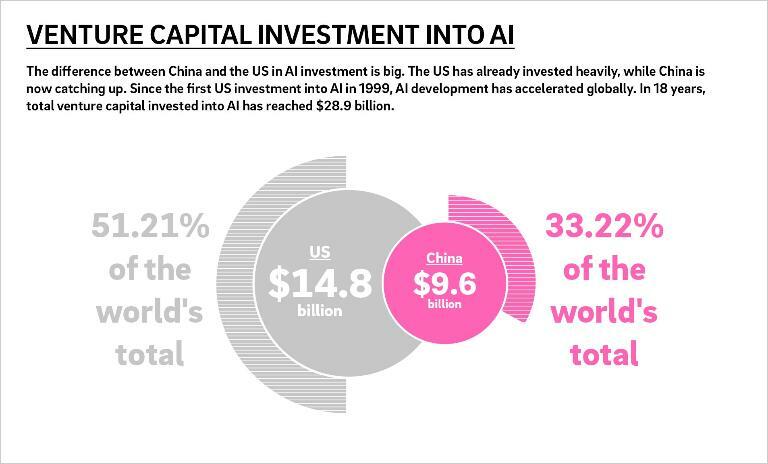 Looking at the overall investment flowing into AI in China, the country is still lagging behind compared with the US. But the total figures belie the speed with which China is catching up. Within just a few years, from 2012 until the first half of 2016, $2.6 billion of investment flowed into China's AI industry, according to a joint report by Wuzhen Institute and NetEase Tech. This is one-seventh of the amount in the US, but already puts China into second place internationally. China is only just getting started. A lot of prominent players in the internet industry have only recently started to adopt AI as their pet subject, but now that they are, they are doing so with a vengeance. "AI technology presents the greatest opportunity in human history, and I encourage you to pay attention to what is happening in China," said Kai-Fu Lee during the World Economic Forum in Davos 2017. Taiwan-born Lee, who helped establish Google China before Google withdrew from China partly owing to censorship concerns, now lives in Beijing and is one of the country's most influential thought leaders on all things internet. Lee studied speech recognition, which has evolved as one of the key areas of AI research, as early as in the 1980s. Now he is leading the startup incubator Sinovation Ventures in Beijing's Haidian District, often called China's Silicon Valley. When Lee first announced the startup fund at a press conference in 2009, mobile internet and cloud computing were the buzzwords. But this year, the incubator with a total fund size of more than $1 billion has started to focus most of its activities on AI. An incubator of optimism: Founded in 2009, Sinovation Ventures is led by Kai-Fu Lee. One reason why China is so optimistic about AI is that it is relatively easy to find real-use cases, or, as AI researchers usually call it, "applications" for AI in this still relatively fast-growing economy. There is real demand in a lot of industries, with companies wanting to improve efficiency in order to cash in on the commercial opportunities presented by the rising Chinese middle class: hundreds of millions of consumers who may not yet be as rich as the middle class in the US and Europe, but who have more and more disposable income. "It is a revolution," says Li Peng, who is in charge of financial products in Baidu's big data business unit. His team has started to offer AI-powered solutions to banks, insurance companies and other financial service providers in China. "AI technology presents the greatest opportunity in human history." Li brims with enthusiasm: "It used to take banks many days to identify new target customers for high-end credit cards or to assess the credit risk for a loan application, and now we can help them to do the same in just a few hours." To help find new customers for new products with increased efficiency, the big data team at Baidu will first ask their corporate clients for a sample of existing customers, for example 30,000 bank clients who have already applied for a certain credit card. Next, they build a mathematical model based on a composition of 100,000 tags, then filter Baidu's 760 million users with those same tags, easily identifying more target customers, which are later narrowed down further. "We call it big data precision marketing," says Li. This is where China excels, with practical applications of AI. Other necessary elements for AI, like powerful computer chips and innovative research, are still mostly advancing in other countries, mainly in the US. The government in Beijing recently announced, however, that it wants China to become a "premier global AI innovation center" by 2030. The ambitious, top-down policy document issued by the Chinese State Council in July, the Next Generation Artificial Intelligence Development Plan, identifies AI as a key growth driver for the Chinese economy in the coming decade. The government promises more funding for fundamental research and also to facilitate the cooperation between the state, companies and the military. The aim is to leverage what Beijing sees as China's strength in AI: massive data resources and a big talent pool. The report has provoked alarmist press articles abroad about China being determined to overtake the US and dominate the world in a key technology of the future. Yet, on closer inspection, the State Council's plan is quite honest about China's current shortcomings and "technology gaps" in AI. As a first step, by 2020, China wants nothing more but to "catch up" with advanced economies like the US in terms of AI. As a second step, by 2025, China hopes for its first breakthroughs in fundamental AI research. The alignment of big data, recent investor interest and talk about government support has started to attract a lot of promising talent in the field of AI to return to China from all over the world. Like so often, foreign observers easily go into overdrive, extrapolating huge potential from China's mind-boggling numbers while the Chinese stay much more down-to-earth. For example: All the talk about China now "cutting corners" in the race to become the world's leading AI powerhouse spurred the Chinese gaming and social media giant Tencent, who developed the leading Chinese social media platform WeChat, to order some thorough research. Headlined "What Shall We Do With the AI Bubble? ", the Tencent Research Institute's recently published report on AI development in China delivered some sobering news. "There are no signs of cutting corners at all. In fact, China has so far made only partial breakthroughs," the report says after quoting figures and comparisons, for example the more than 1,000 AI companies in the US versus the more than 500 in China. China has so far less than half as many companies engaged in processor and chip development, as well as less than half as many engaged in basic technology, it pointed out. And the Tencent Research Institute even included a warning, quoting an oversupply of funds and not enough projects to invest them in, the telltale sign of a developing bubble. Still, the government's ambitions have been announced and China's track record with development plans for certain industries or infrastructure suggests that, here again, Beijing at least means business. Even more so as the official embrace of AI is driven by sheer necessity. Faced with a rapidly aging population and rising labor costs, economists have warned that China might "grow old before it can grow rich." As the technocrats at the helm of China's communist party and government are struggling with slowing growth and with a difficult transition from a manufacturing to a consumer economy, they are in desperate need of new growth drivers. 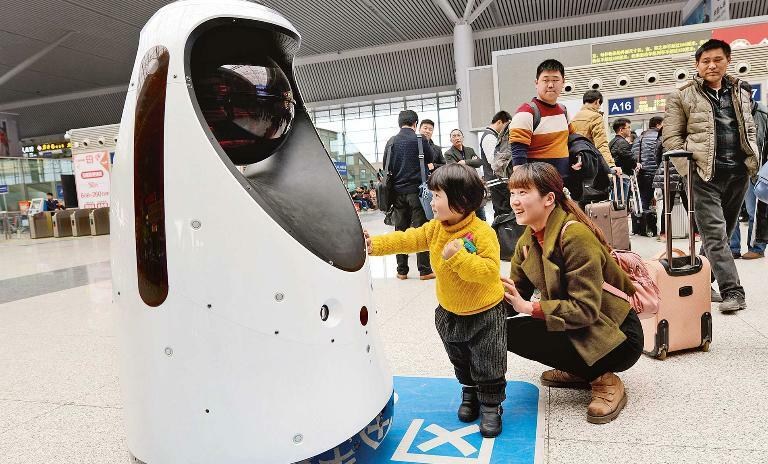 To protect and serve: The police robot at Zhengzhou East Railway Station can clean, monitor air quality, detect fire and also compare passenger faces to those of escaped criminals. AI may not be the solution to all of China's problems, and it may be a while before China leads the world, but the alignment of big data, recent investor interest and talk about government support has started to attract a lot of promising talent in the field of AI to return to China from all over the world. Take Li Yunpeng. Until recently, the 38-year-old worked as a software development director in the database division of Oracle America. 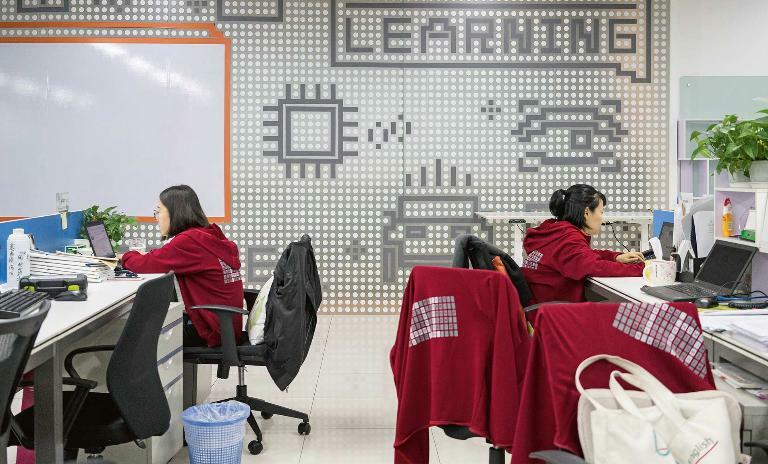 "Honestly, I had already built a good life for me and my family in the US," says Li, now sitting in the new office of his AI startup SkyData in Nanjing, in the Chinese coastal province of Jiangsu. "I am still ambitious. I thought it was a great opportunity to come back to China and help my motherland with the next stage of its development. And I see great opportunities for entrepreneurs in China." ½ as many companies in China are engaged in processor and chip development as in the US, according to the Tencent Research Institute. It was not difficult for Li Yunpeng to find some first clients for SkyData's products. His startup now uses AI to help the China Guodian Corporation, one of the five largest power producers in China, to maintain its windmills. SkyData's algorithms identify the need to change certain windmill parts before a breakdown can lead to downtime. Yet despite his personal optimism, Li Yunpeng cautions to keep predictions about China's rise in AI realistic. "Everybody is talking about the huge data pools in China," he says, "but for AI to blossom, you need consolidated data sources. What we find here in China are not clear ponds that we can fish with a net, but rather muddy data swamps." 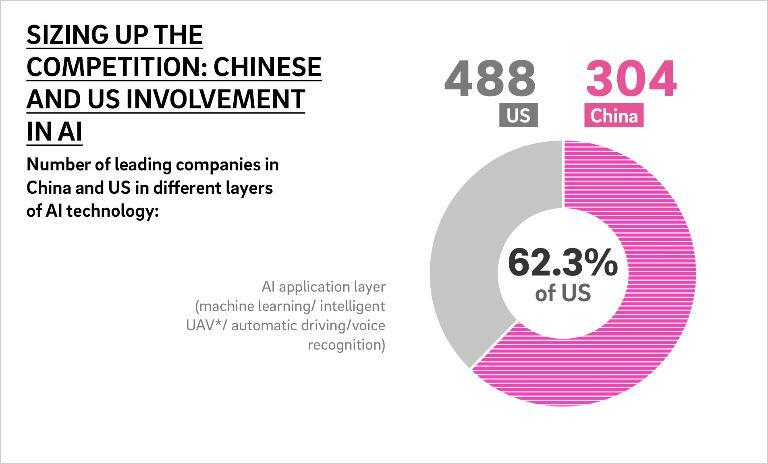 To catch up with the US or even overtake them in terms of AI, China would need to close a huge gap in this field alone. Li Yunpeng believes it can be done, but it will take at least five years to do so. Still, he would not want to be anywhere else at the moment. "Local governments here in China really give startups a chance. They introduce state-run companies as potential customers to us. As a startup entrepreneur in China, you get a chance even without a long track record." Another AI researcher recently returned to China is the 33-year-old Han Dong, back from Germany to his native Shanghai. He studied computer science in Saarbrucken, worked as a research assistant at the renowned Max-Planck-Institute and the German Research Center for Artificial Intelligence (DFKI). "When I started to study computer vision and other fields of AI more than a decade ago, it was still very difficult to find a job outside of academia. That was true for a lot of Chinese talent in the US and Europe. Now all these people get a lot of opportunities back home," says Han. 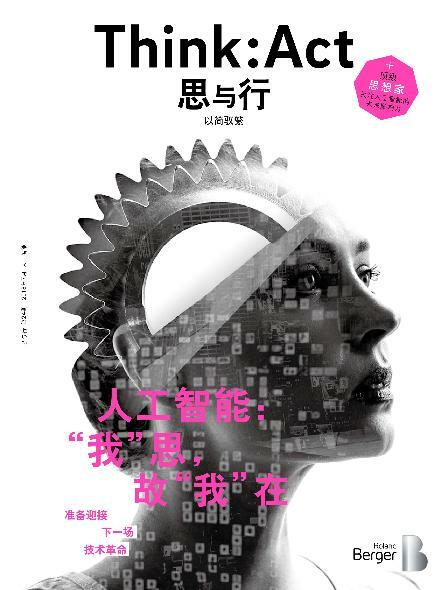 And it is perhaps this fact, the return of the natives more than government plans and investor interest that could drive the rapid rise of AI in China in the years to come.